Perfectly located in the heart of the capital of Ha Noi. Hanoi Happy Hotel has 30 rooms with modern facilities to ensure absolute comfort and pleasure while staying in this new hotel. With only a 3 minute walk, you can go to many tourist attractions such as the Ngoc Son Temple, Ha Noi opera house, Thang Long water puppet theatre and the special atmosphere of Ha Noi’s old quarter. 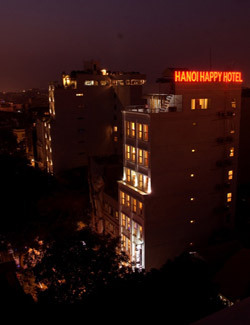 The Hanoi Happy Hotel gives a felling of a warm and relaxing environment for guests, bringing meaning to the hotel ‘s banner , "Bring Happiness To Your Stay”. All rooms including city view rooms provide guests with extensive international services and facilities. All rooms are equipped with air conditioner, ADSL, internet access, IDD telephone, satellite TV, mini bar, bathtub as well coffee and tea making facilities are available for city view and deluxe rooms. From opening windows, you can feel and see an exciting atmosphere of Ha Noi life-style which is a romantic view of the old quater. The Hotel staffs are well trained with high and professional skills. Training classes for staff with the principle of “maximizing the guests satisfaction” will make you feel at home. Stay at the Hanoi Happy Hotel, enjoy the most comfortable atmosphere and an ambience of elegance. We take you home away from home through the honesty, hospitality and professional service. Validity: Jan, Feb, Mar, Apr, Sept, Oct, Nov and Dec.